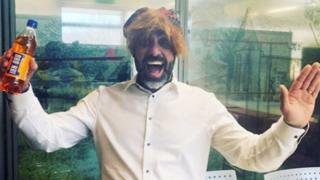 Vodafone has apologised after a manager posed in a See You Jimmy hat in an "insulting" social media post amid jobs losses in Scotland. Antonio Shabbir, a customer operations director, was also holding a bottle of Irn Bru in the picture posted on the company's staff intranet on Wednesday. It came weeks after it was confirmed 312 jobs in the Berkeley Square office, Glasgow, would be relocated or face redundancy. The firm said "no offence was meant". It is believed the picture, which was captioned "some exciting news to share", has since been deleted. Vodafone said the image was posted in order to promote a competition in which employees could win an all expenses paid trip to Edinburgh. A spokesman for the company said: "Mr Shabbir has apologised and he is mortified that it caused offence. "It is just really unfortunate he used those props without thinking, the timing of it wasn't very clever and he understands that." When asked if Mr Shabbir faced disciplinary action over the post, the spokesman said: "It is not something we are considering." A statement from the firm added: "It was an internal event. No offence was meant and we apologise unreservedly." At the end of January Vodafone staff in Glasgow were told hundreds would be forced to move to Manchester, Stoke-on-Trent or Newbury in order to retain their positions. MP Alison Thewliss, whose constituency includes the Berkeley Square office, criticised the move in the House of Commons on Thursday, adding the social media stunt "added insult to injury". It came during the business statement from Andrea Leadsom, who said the "joke" was "in extremely poor taste". Job losses in Glasgow have come as part of a wider restructuring process at Vodafone in which smaller offices will be closed down. Thursday marked the end of a three month consultation process, during which employees were asked whether they could move to offices in England. Vodafone insisted the recent cuts did not mean the firm was leaving Scotland or closing the Glasgow office. A Vodafone spokesman added: "Our teams are currently spread out in smaller offices across the UK. "We are moving some people into larger centres of excellence across our consumer, digital and technology operations. "This will impact 312 employees currently based in our Glasgow office. Our consultation process is ongoing with these employees to assess their individual circumstances; we want to retain as many of the people affected by these changes as possible. "We will still have an employee base of around 410 employees at the office in Berkeley Square and more than 500 employees based at our partner customer service centre in Kilmarnock. "We will continue to invest more widely in Scotland. Glasgow will be one of our main 5G test beds and we are rolling out full fibre broadband to three Scottish cities in partnership with CityFibre."